“ Show Racism the Red Card” www.theredcardscotland.org A FREE three day event bringing, funded by ‘Show Racism the Red Card’ bringing together young people. 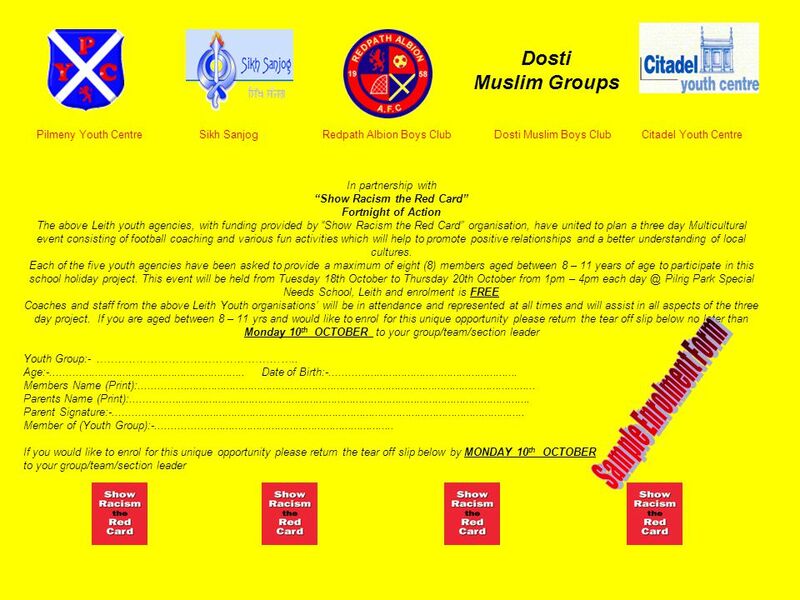 4 A little bit of information about our groups:- Dosti Muslim Groups Pilmeny Youth Centre, located at Buchanan Street in the Lorne/Pilrig ward of Leith serving the young people of the community and providing a variety of social and recreational activities. 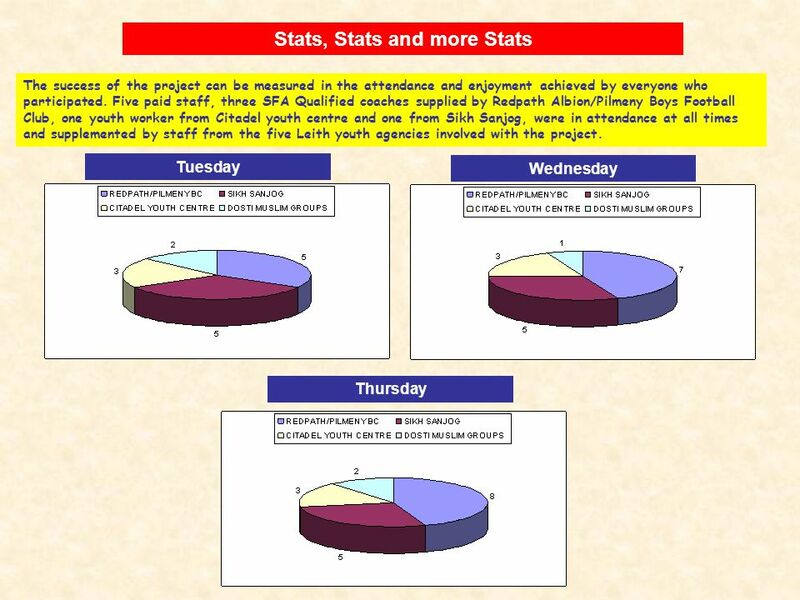 Part funded by the City of Edinburgh Council the centre’s evening youth provision is wide and varied. Founded in 1984 Juvenile and Amateur club formed in the late 50’s by the workforce of the local steelworks, Redpath Brown and Co, Albion Road, to provide football for works apprentices, the Boys Club was formed in 1988 to provide football and sporting activities for young people in the Lorne/Pilrig communities. 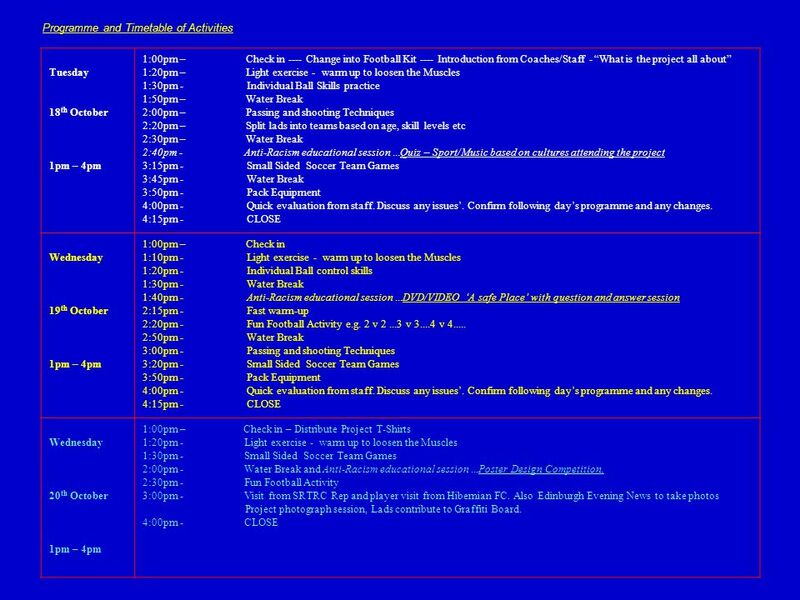 SFA Qualified coaches work on a voluntary basis with the club’s U10-U11-U12-U14 and Amateur sections and current membership stands at 70+. Founded in 1957 Sikh Sanjog was set up in 1989 under the name of Leith Sikh Community Groups. At this stage, a number of Sikh families were receiving help from another of the voluntary organisations - "Leith Home Start", but they only catered specifically for families with children under the age of five years. It was realised that many Sikh women were isolated and because of culture, it was difficult for them to join any groups for social activities outwith their own religion. The boys group aims to encourage members to become actively involved in decision making and planning their own programme. Activities include football, pool, table tennis and outings. Dosti aims to promote education, health and social welfare of children and their families particularly in the Muslim Community respecting its cultural and religious views running a variety of activities to children’s groups ranging from sport, arts and crafts to outing’s. Based at Leith Walk, Dosti have an effective network reaching the Muslim communities in Leith and North Edinburgh. The centre offers all local children and young people a programme of play, activities and opportunities designed to encourage, develop and reinforce their skills and self-image in a safe and supportive environment. The centre promotes work with socially excluded children and young people experiencing difficulties and/or coming from a background of disadvantage. 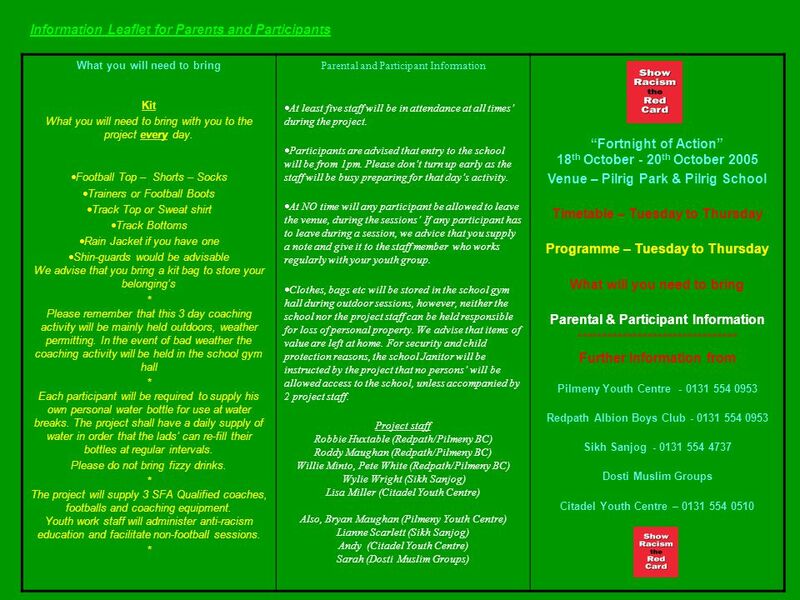 7 Tuesday 18 th October 1pm – 4pm ‘Let the Fun Begin’ On arrival each boy was registered and introduced to the football coaches and staff, then following a quick presentation of ‘what the project was all about’ Football Coaching was facilitated on the football parks adjacent to the school. A total of 15 lads’ aged 8 – 13 years were given the opportunity to express their football skills under the expertise of the our three SFA Credited football coaches. Fun games and a multi-cultural quiz based on sport, music and general knowledge was facilitated by the youth work staff which allowed the young participants to interact in teams of mixed culture. A short break was enjoyed and the lads ‘tucked’ into fresh fruit and nutritional snacks. Sample Quiz Questions. Quiz Question – ‘Who was Albert Wharton’? Quiz Question – ‘How many languages spoken in UK? Quiz Question – ‘Celtics Bobo Balde originates from where?’ All were answered correctly! 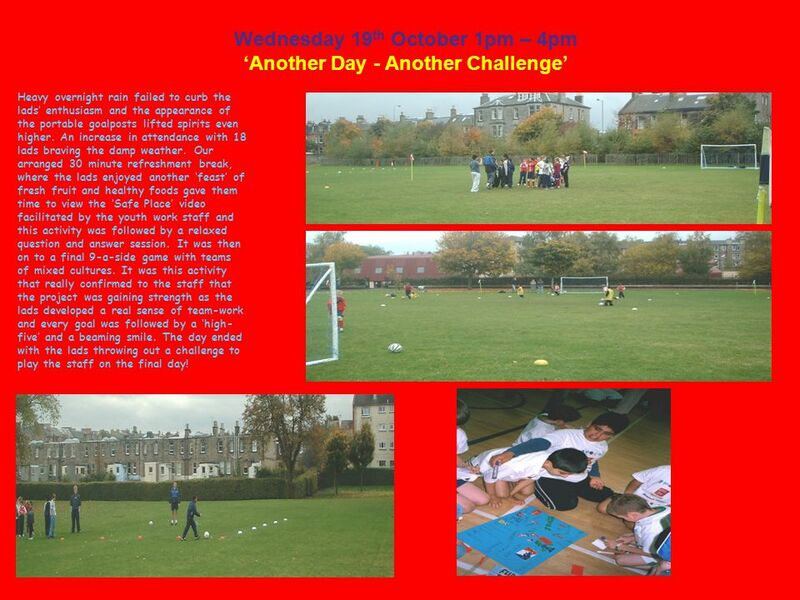 8 Wednesday 19 th October 1pm – 4pm ‘Another Day - Another Challenge’ Heavy overnight rain failed to curb the lads’ enthusiasm and the appearance of the portable goalposts lifted spirits even higher. An increase in attendance with 18 lads braving the damp weather. Our arranged 30 minute refreshment break, where the lads enjoyed another ‘feast’ of fresh fruit and healthy foods gave them time to view the ‘Safe Place’ video facilitated by the youth work staff and this activity was followed by a relaxed question and answer session. It was then on to a final 9-a-side game with teams of mixed cultures. It was this activity that really confirmed to the staff that the project was gaining strength as the lads developed a real sense of team-work and every goal was followed by a ‘high- five’ and a beaming smile. The day ended with the lads throwing out a challenge to play the staff on the final day! 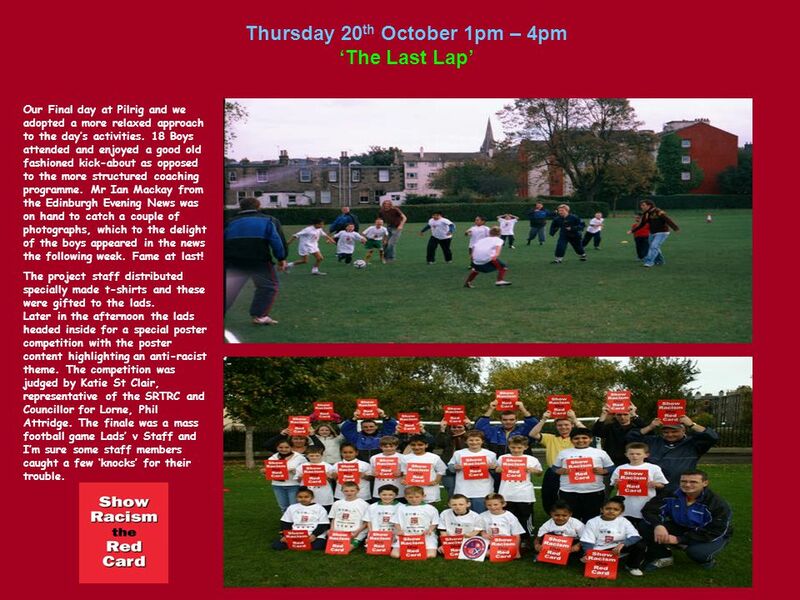 9 Thursday 20 th October 1pm – 4pm ‘The Last Lap’ Our Final day at Pilrig and we adopted a more relaxed approach to the day’s activities. 18 Boys attended and enjoyed a good old fashioned kick-about as opposed to the more structured coaching programme. Mr Ian Mackay from the Edinburgh Evening News was on hand to catch a couple of photographs, which to the delight of the boys appeared in the news the following week. Fame at last! The project staff distributed specially made t-shirts and these were gifted to the lads. Later in the afternoon the lads headed inside for a special poster competition with the poster content highlighting an anti-racist theme. The competition was judged by Katie St Clair, representative of the SRTRC and Councillor for Lorne, Phil Attridge. The finale was a mass football game Lads’ v Staff and I’m sure some staff members caught a few ‘knocks’ for their trouble. 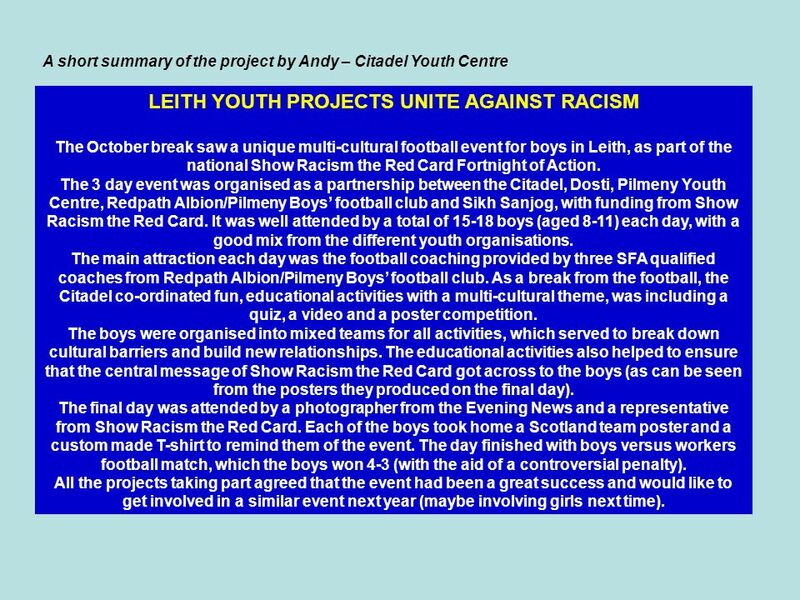 11 Through the Lens Continued…..
13 A short summary of the project by Andy – Citadel Youth Centre LEITH YOUTH PROJECTS UNITE AGAINST RACISM The October break saw a unique multi-cultural football event for boys in Leith, as part of the national Show Racism the Red Card Fortnight of Action. 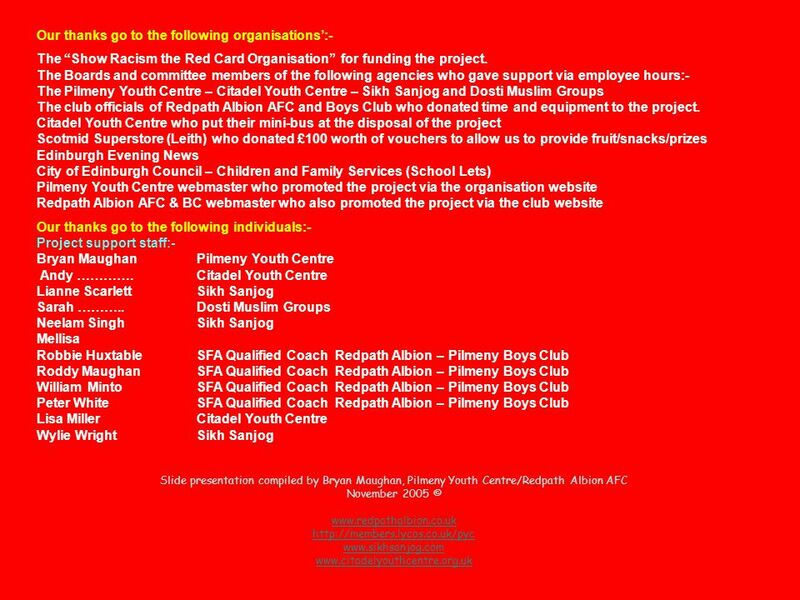 The 3 day event was organised as a partnership between the Citadel, Dosti, Pilmeny Youth Centre, Redpath Albion/Pilmeny Boys’ football club and Sikh Sanjog, with funding from Show Racism the Red Card. It was well attended by a total of 15-18 boys (aged 8-11) each day, with a good mix from the different youth organisations. The main attraction each day was the football coaching provided by three SFA qualified coaches from Redpath Albion/Pilmeny Boys’ football club. As a break from the football, the Citadel co-ordinated fun, educational activities with a multi-cultural theme, was including a quiz, a video and a poster competition. The boys were organised into mixed teams for all activities, which served to break down cultural barriers and build new relationships. 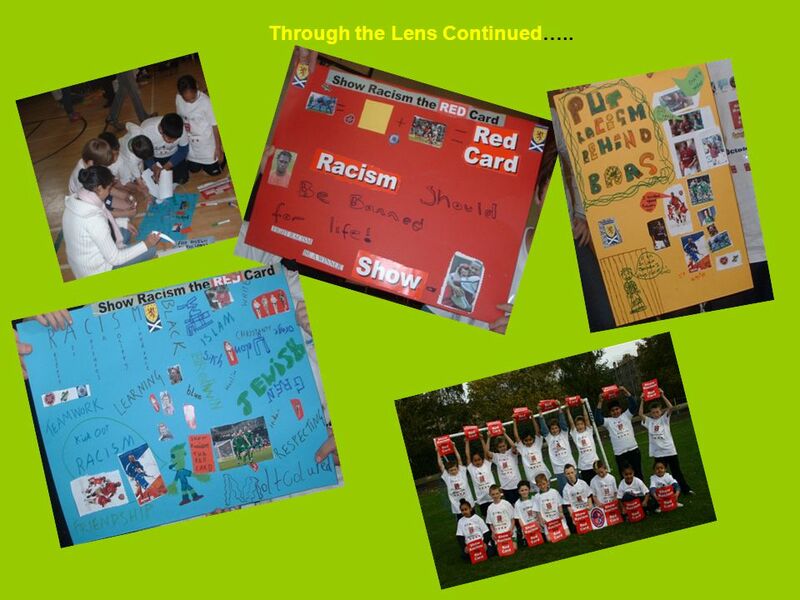 The educational activities also helped to ensure that the central message of Show Racism the Red Card got across to the boys (as can be seen from the posters they produced on the final day). 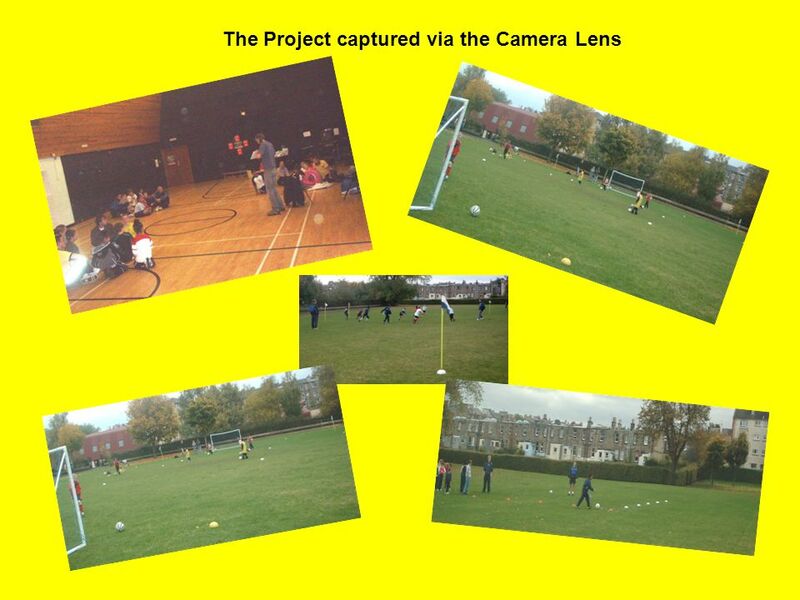 The final day was attended by a photographer from the Evening News and a representative from Show Racism the Red Card. Each of the boys took home a Scotland team poster and a custom made T-shirt to remind them of the event. The day finished with boys versus workers football match, which the boys won 4-3 (with the aid of a controversial penalty). All the projects taking part agreed that the event had been a great success and would like to get involved in a similar event next year (maybe involving girls next time). 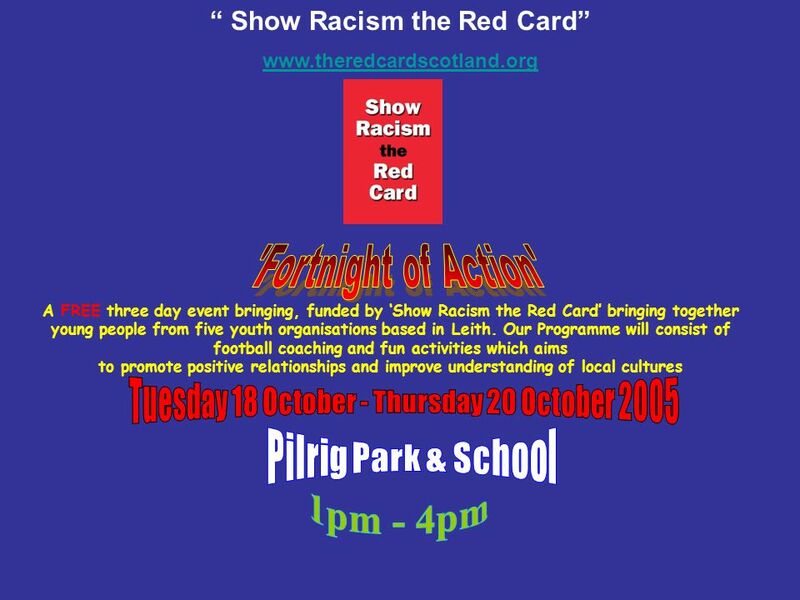 Download ppt "“ Show Racism the Red Card” www.theredcardscotland.org A FREE three day event bringing, funded by ‘Show Racism the Red Card’ bringing together young people." Transition to Year 3. Introducing the Team… Mrs Ford & Mrs Hunt: Team Leaders Mrs Newbolt. INTRA MURAL SPORT – THE DEVELOPMENT OF NEW PROGRAMMES. Welcome back to the new term. We hope everyone is settling into secondary school. October 5 th Chocolate Fondue 12 th Challenge Night 19 th Chiller Night. 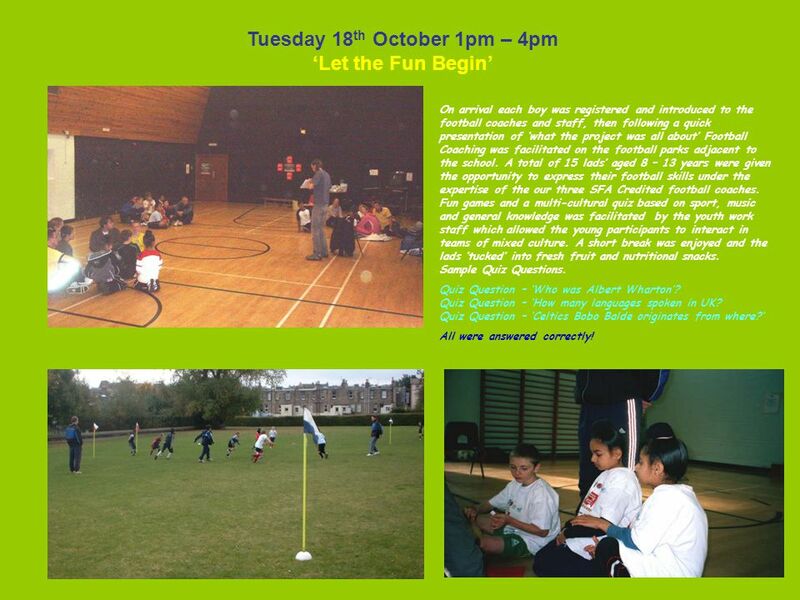 Fun games, skills, competitions and much more!!! 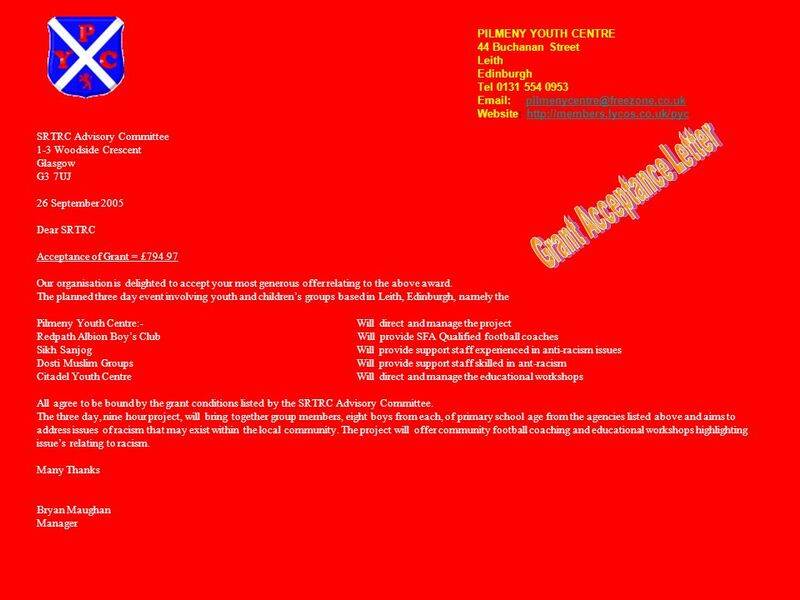 Half Term Holiday Club 2012 Application Form – Page 2 Name: Address: Post Code: Date of Birth: Emergency. PE and School Sport The way forward for St. Mary’s CE Eccleston Louise Rodofile. Kindergarten Curriculum Night Holy Trinity Elementary. Multi-Cultural and Anti Racism Project Local young people aged 9 – 12years and 13 – 16years FREE SOCCER SKILLS PROJECT JUNIOR. A guide to success! By Mr Cronin Head of PE and PSHE. Spring Baseball/Softball Parents Meeting February 11 th at 6:30pm 2016.